St. Bonaventure has been mentioned before, writing a biography of Francis of Assisi and disagreeing with Averroes' definition of the soul. He probably deserves his own entry. He was born in either 1217 or 1221 as Giovanni di Fidanza in Bagnoregio (about 90 kilometers northwest of Rome). In his early 20s he became a Franciscan friar and studied at the University of Paris, quickly developing a reputation as a scholar. 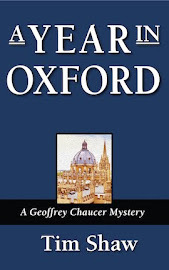 He was even made a lecturer on the Four Books of Sentences of Peter Lombard. He took his Masters degree in 1257 in the "same class" as Thomas Aquinas. 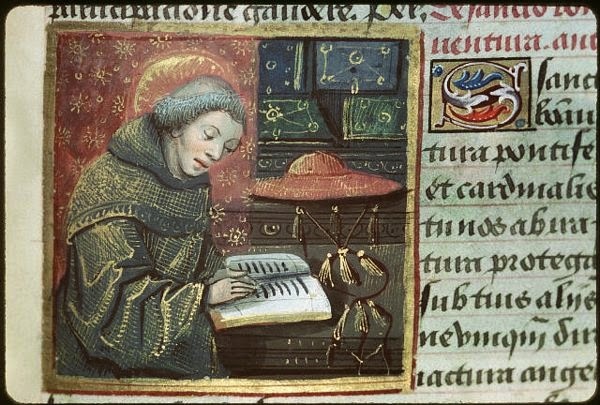 Bonaventure was later declared a "Doctor of the Church" for his erudition and writings, but unlike his classmate Thomas Aquinas he was called away from the academic life. In 1273 he was made a Cardinal by Pope Gregory X and given the task of reconciling Roman Catholic and Greek Orthodox-Byzantine religions. This was to culminate in the Second Council of Lyons, where he died on 15 July 1274. It is not possible in a brief blog post to do justice to the extent of his learning or the breadth of his career: he was made Minister General of the Franciscans in 1257 to try to overcome the growing disagreement over to what extent the order should embrace poverty. We will likely see more of him in the future.